When I was a kid, I worked for Roving Day Camp for the Boy Scouts. The days were spent teaching Cub Scouts about swimming, and shooting bb guns, and singing songs, but the evenings were our own. It was during these evenings that I was first introduced to Dungeons & Dragons. To be specific, I was introduced to Advanced Dungeons & Dragons, 2nd Edition. This happened over the summer of 1991, and I spent the next nine years collecting dice, source books, trying other systems, and making many friends through gaming groups. Later on, I had a chance to sit behind the screen for a group of friends, running Dungeons & Dragons 3.0. This was back around 2006, and not including a brief flirtation with some pick-up games of Next at Gen Con, I really haven’t picked up the dice that much since then. Fast forward to this year. Right after Gen Con, Wizards of the Coast introduced Dungeons & Dragons 5th Edition. To my understanding, there was some mis-steps taken with 4.0, and this version was play tested, and demoed, and play tested again, with a goodly amount of gamer input. This has resulted in a game system that, at least to my first impressions, is focused on the story and the game itself, and not so much on the math that really bogs down the game sometimes. Seriously, does any of my readers remember THAC0? I was never a math fan, and that didn’t help. Not long after Gen Con, I was approached by a rep from Wizards of the Coast, wondering if I wanted to take a look at any of the new books. Being a good guy, I told them that I had already pre-ordered my Player’s Handbook through my FLGS, Hero’s Emporium, but I wouldn’t mind taking a peek at their first adventure, “Hoard of the Dragon Queen”. They thanked me for letting them know about the Player’s Handbook, and told me they’d have a copy of Dragon Queen out soon. 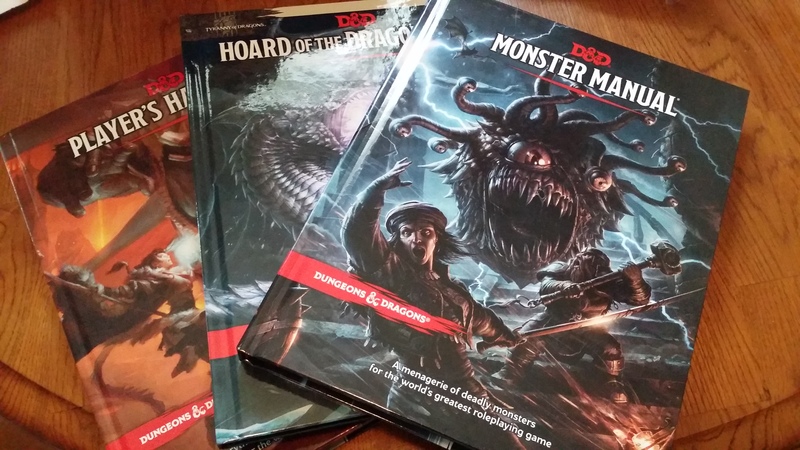 Not only did they send me “Hoard of the Dragon Queen”, but they send me another PHB and an advance copy of the Monster Manual, which is being released at the end of this week! These books are going to be excellent. Do you know why? Well, in all honesty, I’m getting back into D&D. I’ve got my dice, I’ve got new mechanical pencils, I have some clean character sheets, and I have a group to play with. I’m going to revisit one of the first types of characters that I used to play, which has recently received some love: The Bard. Yep, I’m jumping on the Bardish Bandwagon. 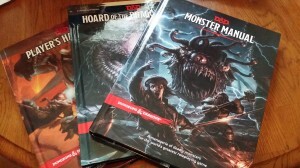 This is going to be a fun game, and while I’m itching to thumb through Hoard, I also know it’s what the DM is planning on running, so I do not want to ruin the adventure! While I haven’t had a chance to flip through the books much at all, there is one thing I’d like to point out, concerning the Monster Manual. As I was working on this post, I was also breezing through Twitter. As I was doing that, one of the folks I follow, David Flor, asked if “Are lamias what they’re supposed to be now, or that silly shapechanging thing in 4E?” Well, since I’m sitting right here, with the book beside me, I was able to confirm that there are no beetle swarms in the description of the lamia in 5E. Other than that little tidbit, I can say I find everything to be very cool. The artwork on both the covers and the interiors are from different artists, yet there’s nothing that seems to clash, at least to my eyes. I have been able to find everything fairly easy. I’ve had a bit of an issue with character creation, but I think a major part of that is my brain trying to fit things in from how it used to be, and getting confused with how things are now. I have a feeling that soon, these books are going to be as familiar and comfortable as a favorite set of gloves. Keep an eye on the blog over the next few weeks as I really get a chance to buckle down, and take a look at these books, getting my feet wet again in the world of role playing games that don’t involve a controller. Who knows? Soon, you might also see me behind the screen again.